I climbed over the shoulder-height fence into the private property, only to be stared at by… cows. A huge mob of moo-ing cows. I stared at them, they stared back. It felt as if they’re gonna charge at me at any moment. We were separated by only a thin wooden fence. A second wooden gate leading to the trailhead was closed. What should I do? I stood at the bottom of the Cerro Castillo National Reserve contemplating my next decision. It was a last-minute decision that brought me to Villa Cerro Castillo, the small village next to the national reserve. 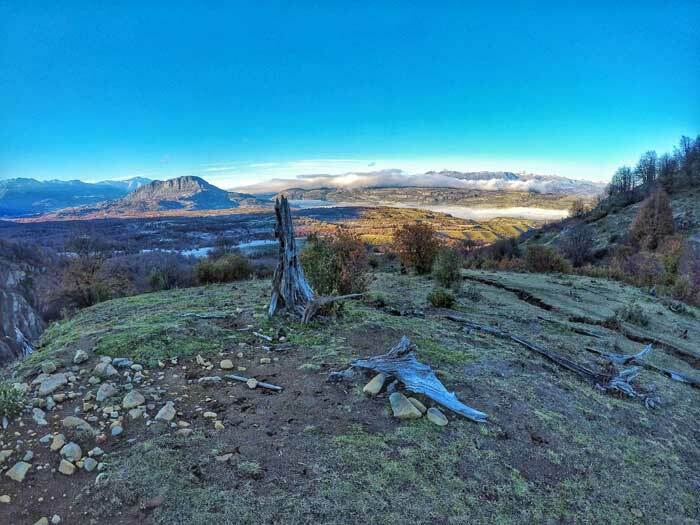 Just 90km south of Coyhaique - the capital of the Aysén Region of Chile - sits the under-deserved national park said to be the ‘New﻿ Torres del Pa﻿﻿ine’. Buses leave Coyhaique regularly. Alternatively, you can take the bus towards Puerto Rio Tranquilo and get off at Villa Cerro Castillo. To return to Coyhaique, you can board the bus that comes from Puerto Rio Tranquilo which stops at Villa Cerro Castillo every afternoon. There are also shared taxis/minivans that leave at 5am in the morning - which my hostel owner kindly arranged for me. Buses go to and from Coyhaique and Puerto Rio Tranquilo, passing by Villa Cerro Castillo in the middle. As luck had it, I was at Puerto Rio Tranquilo for the Marble Caves and decided to get off the bus on the return journey. Joys of flexible travels – changing routes as and when I like it. 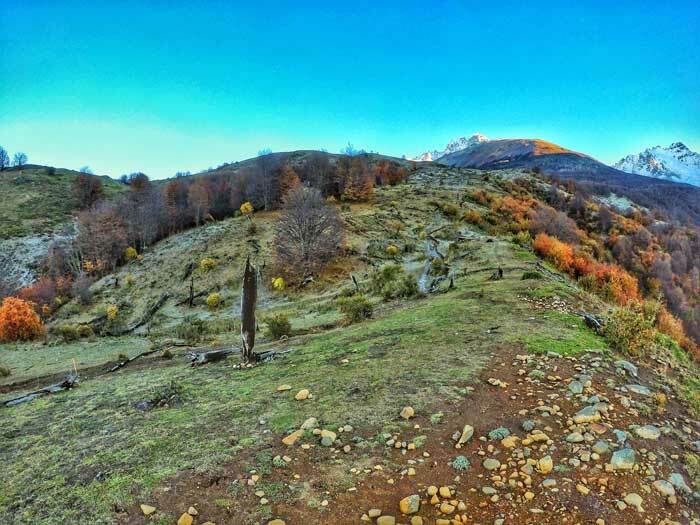 Cerro Castillo National Reserve is a relatively untouched park, known more for its 4-days trek. Not many people know that it’s possible to do a one-day hike to the castle (castillo) at the top. There isn’t much information about it online too. I stayed at Senderos Patagonia, a cosy lodge owned by an American/Chile couple. Mary kindly provided me all the information I required for the trek. Simple enough. 20 minutes later, I arrived at the empty hut and a closed gate. It took a whole 5 min for this law-abiding Singaporean to decide to enter the private property by climbing over the fence. I saved the CLP $5000 (USD $7) entrance fee. And there I was, inside the farm with the cows but not in the park proper, facing a second gate. To be honest, I was afraid of the cows. It was 20 of them against 1 of me. Just then, a gaucho - with his red beret and pack of dogs – walked towards me. Oh no, I am caught red-handed sneaking into a private property. Acting confident wins once again. I also realized the gate was meant to prevent the cows from escaping the farm, not for us hikers. The start of the trail was a forested area, walking past more cows and their incessant moos. Eventually, the trail passed from the shady forest to an exposed ridge, where I could see the canyon below me, and the sparsely spaced autumn coloured trees ahead. This trail is uphill all the way. It is steep; steeper than the ﻿﻿Fitz Roy trek I did a few weeks prior. It didn’t take long before my knees started hurting again. I knew there was a glacier lagoon at the base of the summit and I wasn’t going to give up again. Especially not so after two disappointing hikes at Torres del Paine and at Fitz Roy. 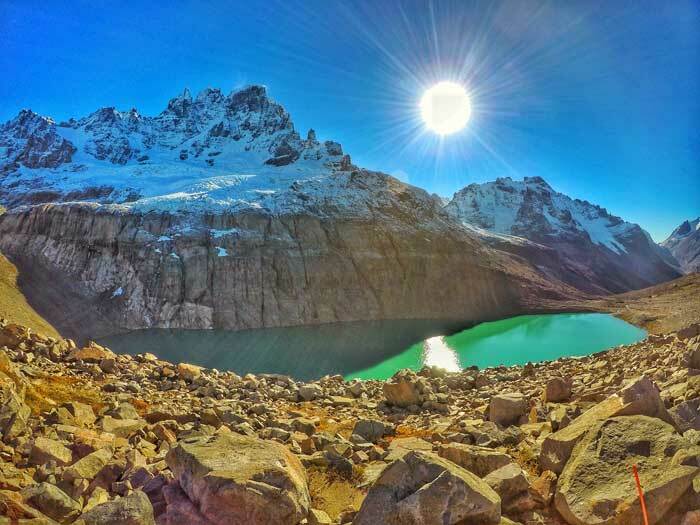 I pushed on, guided by the jagged white and grey peaks of Cerro Castillo and the vast expanse of rolling hills. After an hour, I stopped, suddenly scared. Was I on the trail? All the while, I’d been searching for the thin orange sticks that acted as trail markers, but I hadn’t seen any. It’s easy to miss the subtle trail turns on this path that was not well-trodden. I was completely alone. I hadn’t seen a single soul for 2 hours. It felt like I was exploring entirely new areas. Is this what the very first hikers experienced? Surely, this must be what Patagonia was like before the mass tourism hit it? I backtracked until I saw the sticks, and faithfully followed them. The night before was cold. Puddles were frozen and they cracked as I stepped on them. Near the end of the grasslands was a river crossing. River was an overstatement. It was just the narrow path with water filled to the brim. There was no way around it – the unkempt bushes surrounding the path were filled with thorns. The only way through is through the water. The inexperienced hiker in me hadn’t thought of taking off my shoes to cross it. I stepped into the ‘river’ with my shoes and socks. It was the most disgusting feeling ever. It wasn’t long before I reached a completely exposed point. I could see the rocky turrets in the distance. 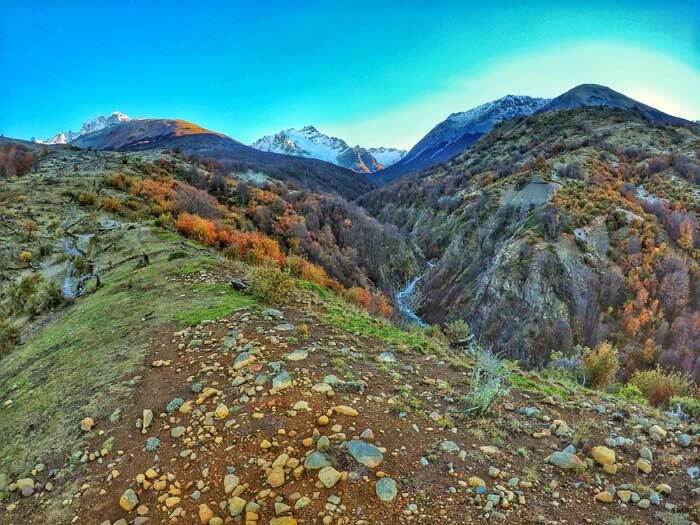 But reaching the castle itself requires hiking through a series of steep switchbacks, loose rocks and scrambling on all fours to navigate over large boulders. At this point I was above the clouds. I felt faint and exhausted. But I wasn’t gonna turn back anymore. I was so close. I told myself to keep on going, and ate a few cookies and continued. It took me 3 hours to reach the blue lagoon at the base of the summit. 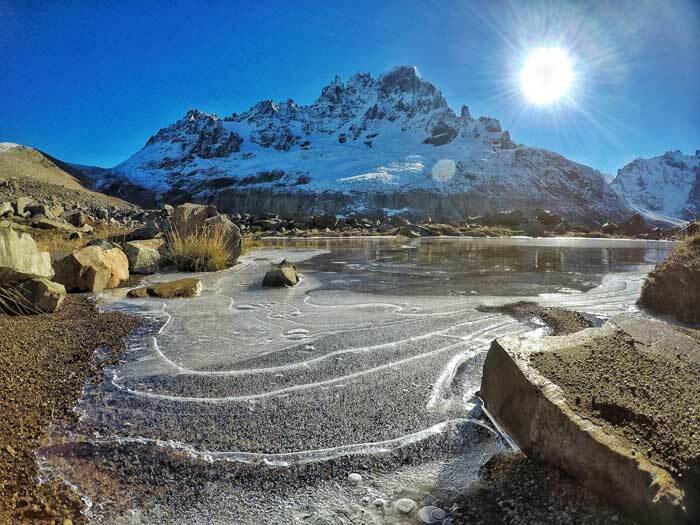 Seeing the Laguna Cerro Castillo was the most euphoric feeling for someone who missed the chance twice before. Third time’s truly a charm. There I stood, staring at Cerro Castillo in all its majesty – jagged snow-capped tooth turrets almost symmetrical like a castle. I sat on the rocks by the lagoon, had lunch and reflected on the adventures in Patagonia. I was glad I continued despite injuring my knee. 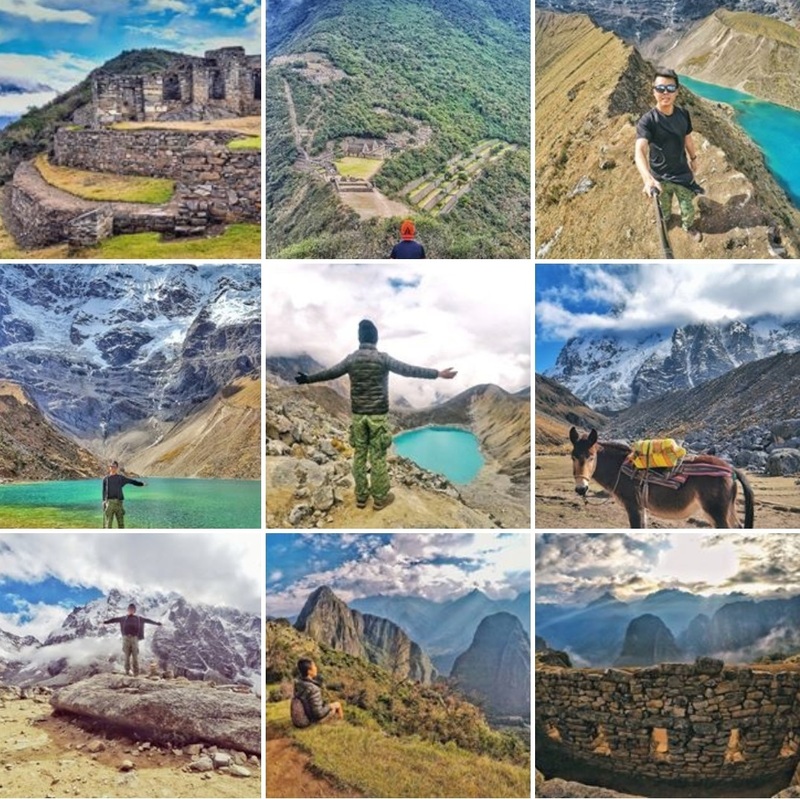 On this hike, and on this journey in South America. I wouldn’t have seen such natural beauty had I given up and went home. In the three hours, I saw only 3 other people. 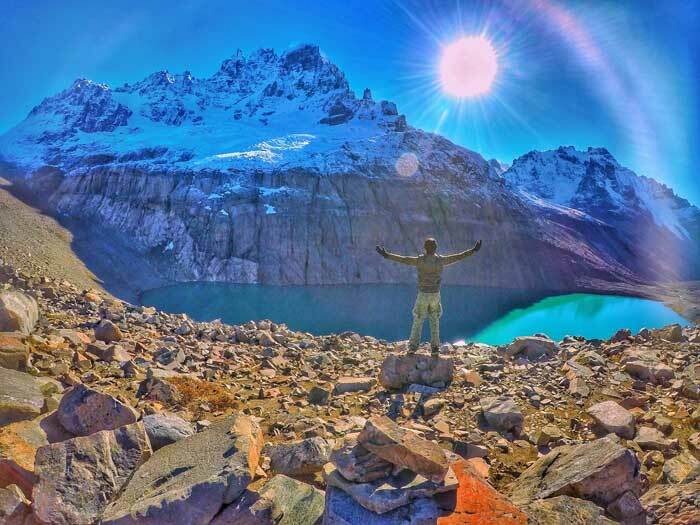 This is the ‘New Torres del Paine’ for you. The descent was a steep scree slope. I had to chop out each step in order to get my footing, lest I slip down the mountain and crash into the rocks and bushes below, or worse, go sailing over the edge. But the view made up for it. 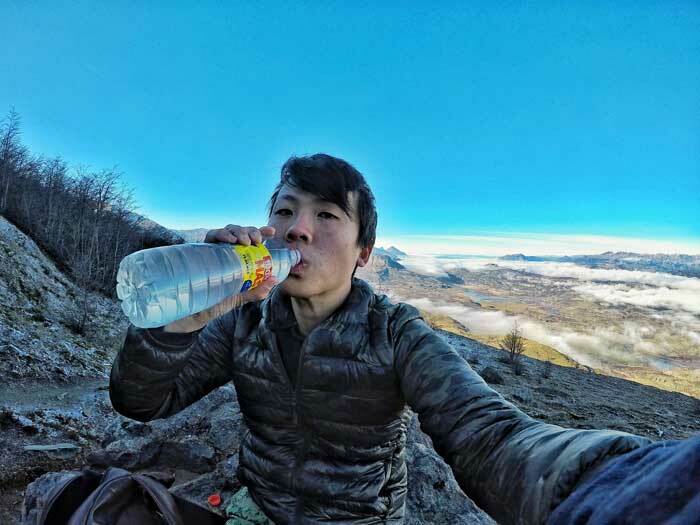 From the top, I could see the beauty of Patagonia stretching out endlessly, the curving road and lakes of the Carretera Austral, and the tiny village of Villa Cerro Castillo – my humble accommodation for the night. With the steep descent came the sharp pain in my knees; so painful that I had to pause several times an hour for a small moment of relief. I knew this would happen, but it was all worth it. And now, it’s your turn. 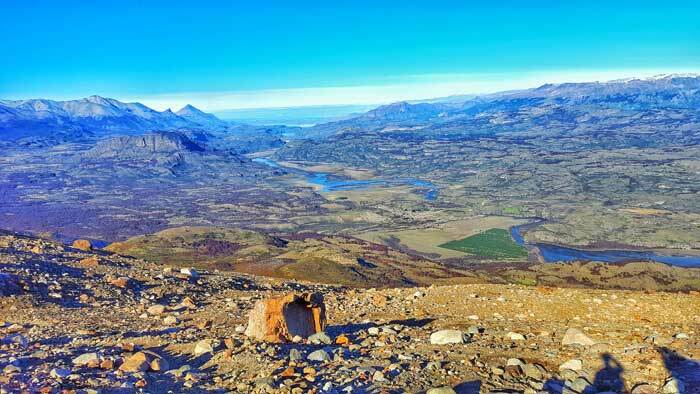 Nice story about your hike up to the glacier and its lake. I enjoyed reading it and I’m glad you really loved it. I noticed also that you linked to our website. Thanks! Did you travel with the Get South travel guidebook? Or did you find the info on our website? I travelled with it when I was in Patagonia. It’s really useful as it’s so thin and light! Hey all! My name is Owen and I am from Singapore! 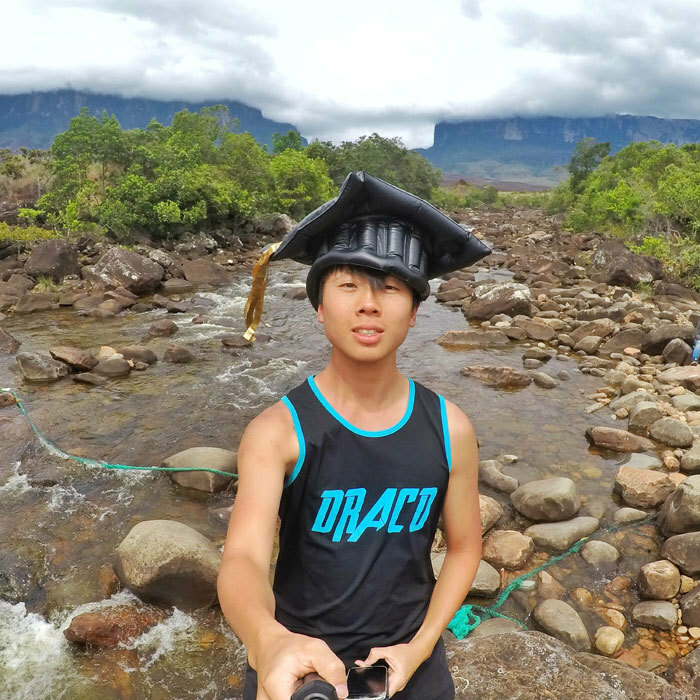 I graduated from University in December 2016 and after my 26th birthday 2 months later, I jet off on a one-way ticket to South America to chase my dreams! 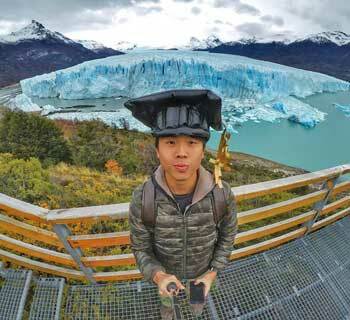 I started this blog (after much procrastination) to record my travels from a Singaporean perspective and hopefully help as many travellers heading to South America as possible. Read more about how and why I started this trip here. Anywhr Review: Is Surprise Travel For Everyone? Want to know how I keep travelling and how you can do the same? Copyright 2019 by My Turn To Travel.